Time off types are categories that employees use to request or enter time off against. Commonly used time off types includes vacation time, sick time, jury duty, or banked time. 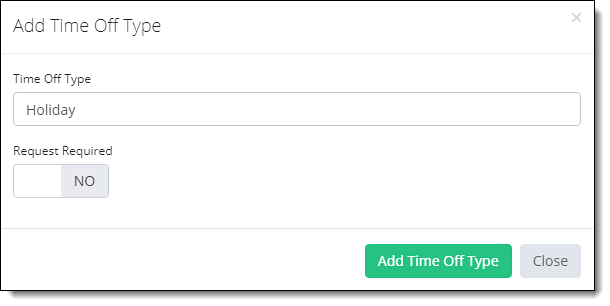 TimeLive provides few pre-defined Time off Types. An administrator can create their own Time off Type based on their own organizational needs. Times off Types are of two types. Time Off Types with “Request Required” enabled. A user will be required to submit [Time Off Request] for these [Time Off Types]. Time Off Types with “Request Required” disabled. A user will be required to enter time off entries in timesheet directly for these [Time Off Types]. Navigate to Admin Options then Scroll to Time Off Setup. Click Time Off Types icon. Click + Add Time Off Type green button on the top-right of the screen. Fill the Time Off Type Field with the Time Off name you want to set. If you want this Time Off Type to be requested from Time Off Request, Click on the box Request Required. If you keep this as No it will only show in My Timesheet of the Employee. Click on Add Time Off Type to add this Time Off Type. 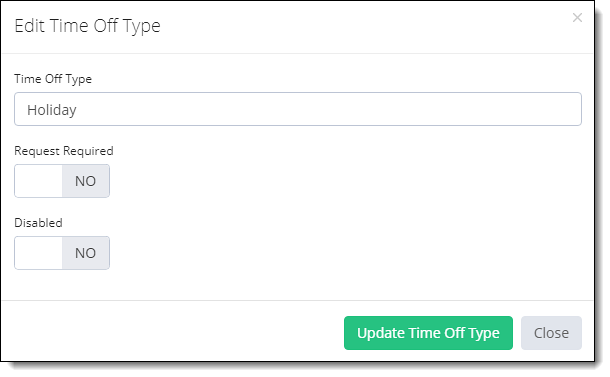 In Time off Type List, navigate to the Time Off Type you want to modify and click the Option gear icon against this Time Off Type. Click Edit Time Off Type. Update your required modification in Time off Type Information form. Click on Update Time Off Type button to update this record. Scroll to the Time Off Type you want to disable, click the Options gear icon and select Edit Time Off Type option. Click on the Disabled Option in the popup. In Time off Type List, navigate to the Time Off Type you want to delete and click the Option gear icon against this Time Off Type.